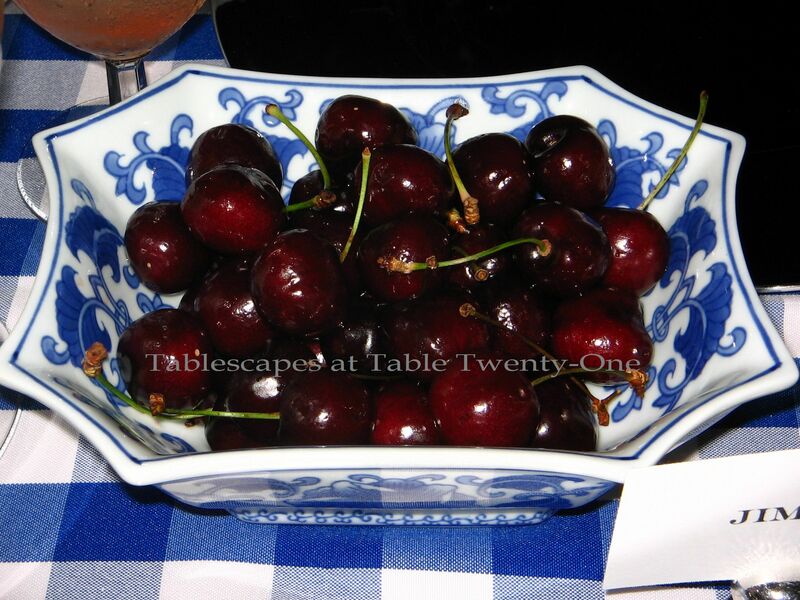 INSPIRATION: Fun summertime melamine dishes found at Tuesday Morning. 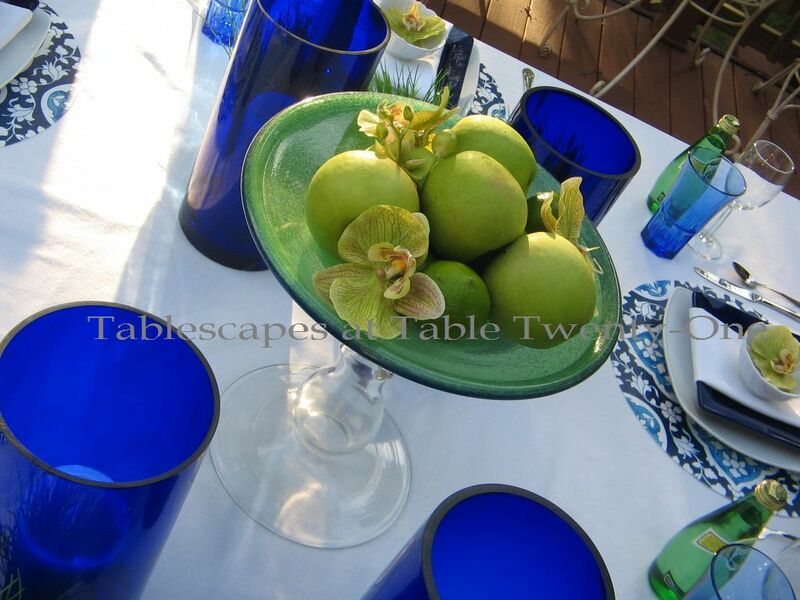 I am all about the bright colors and melamine this summer! 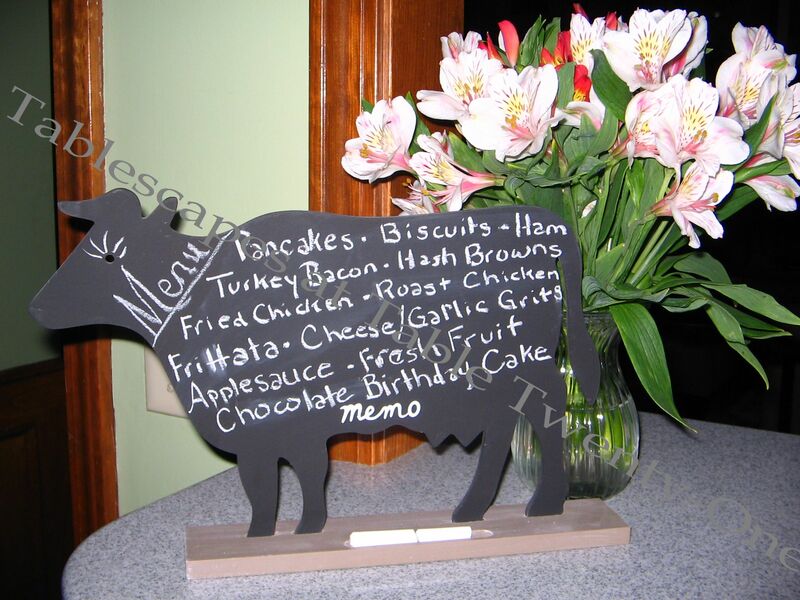 What a great selection there is out there, and the prices are so reasonable! 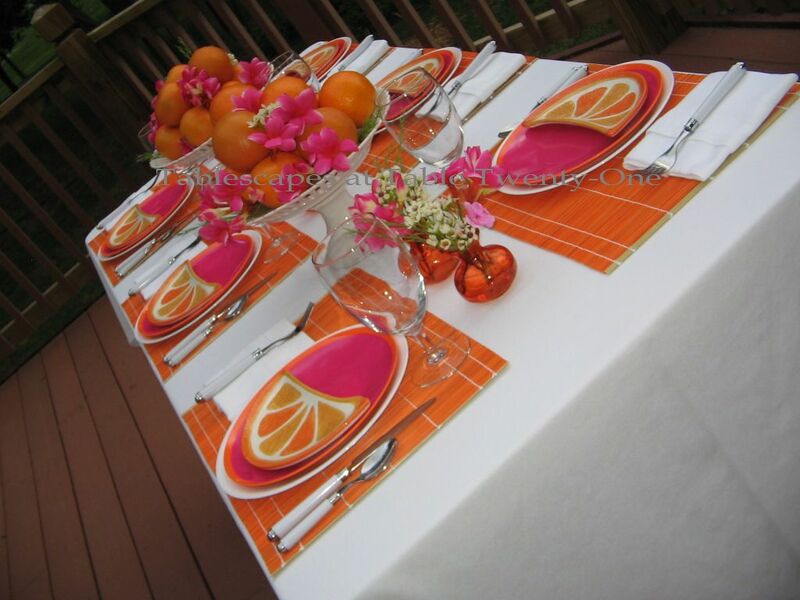 For any casual summertime tablescape, melamine is a fun and inexpensive way to go, and if you go bright that just kicks it up a notch! 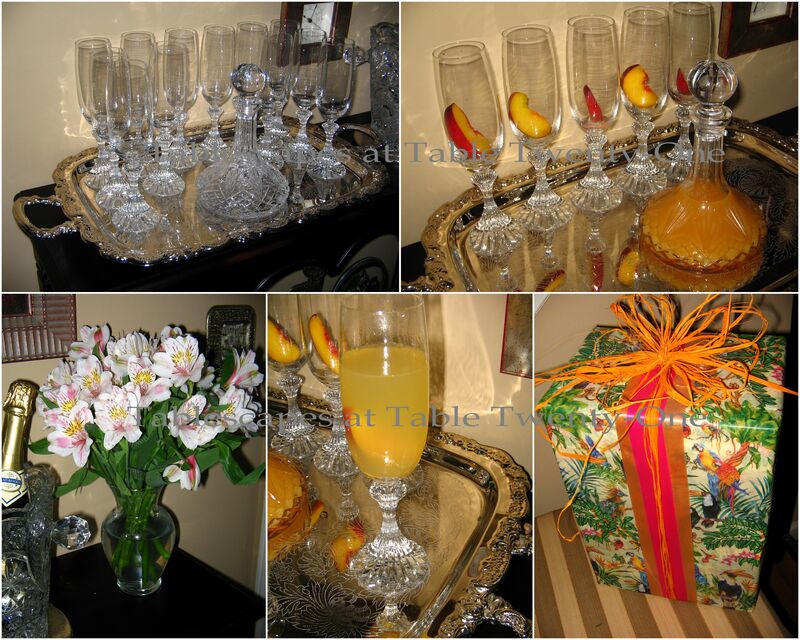 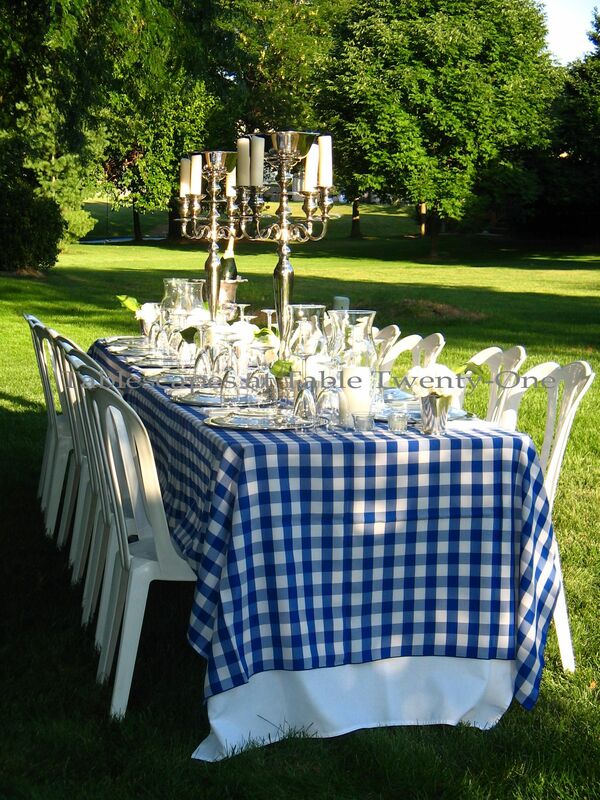 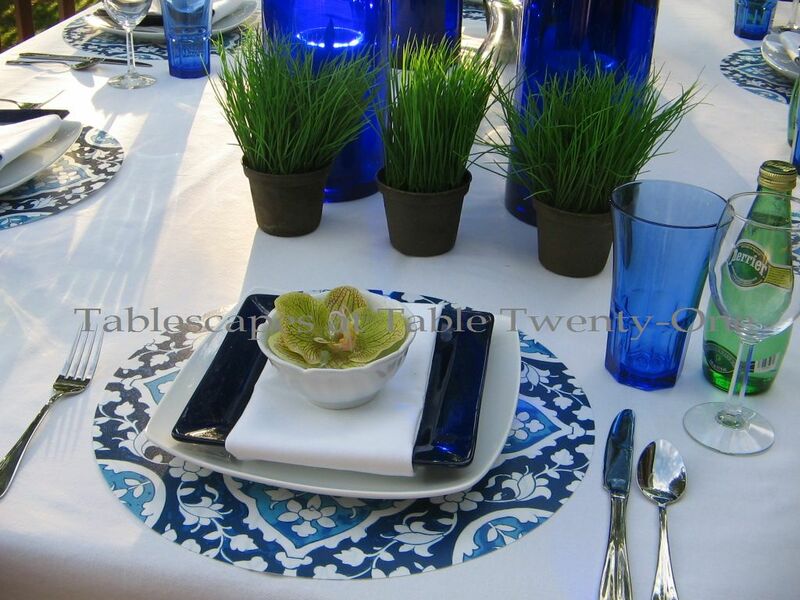 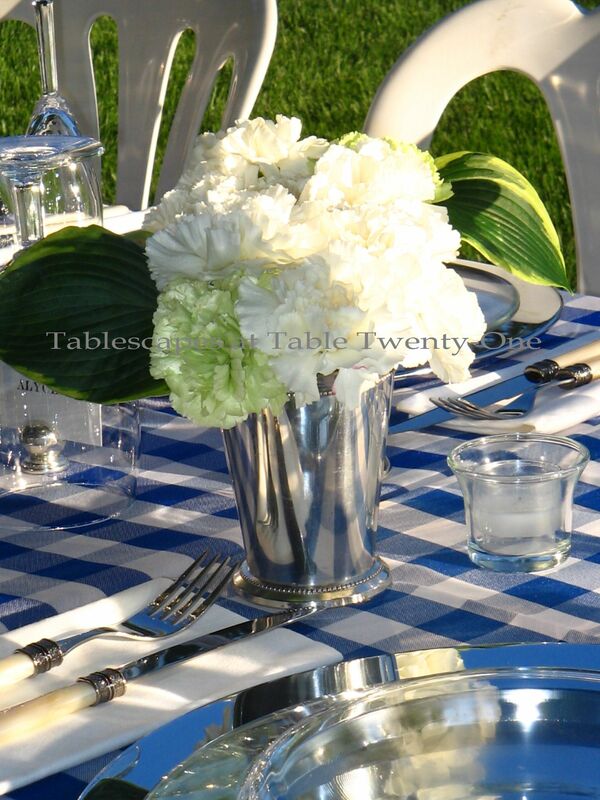 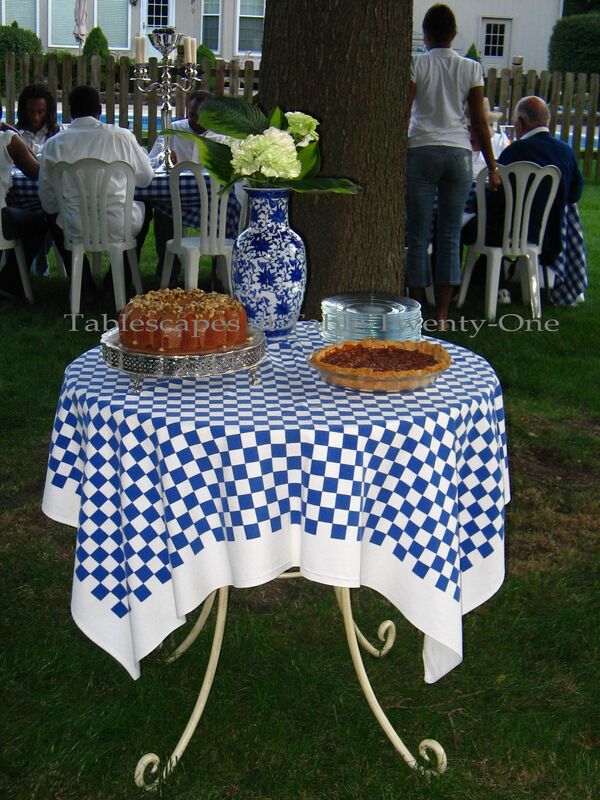 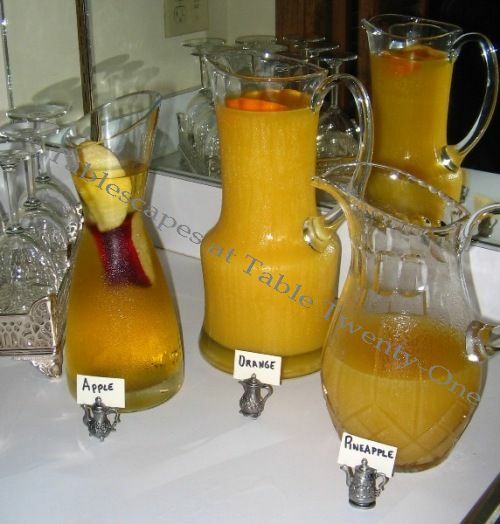 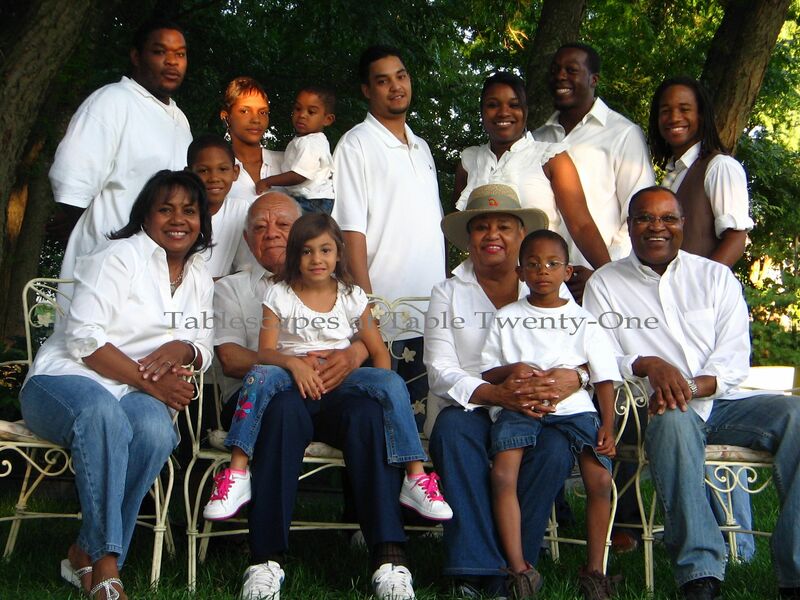 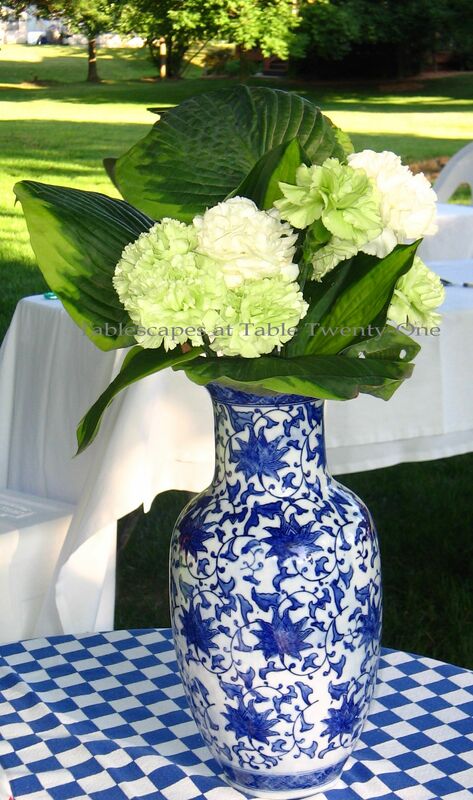 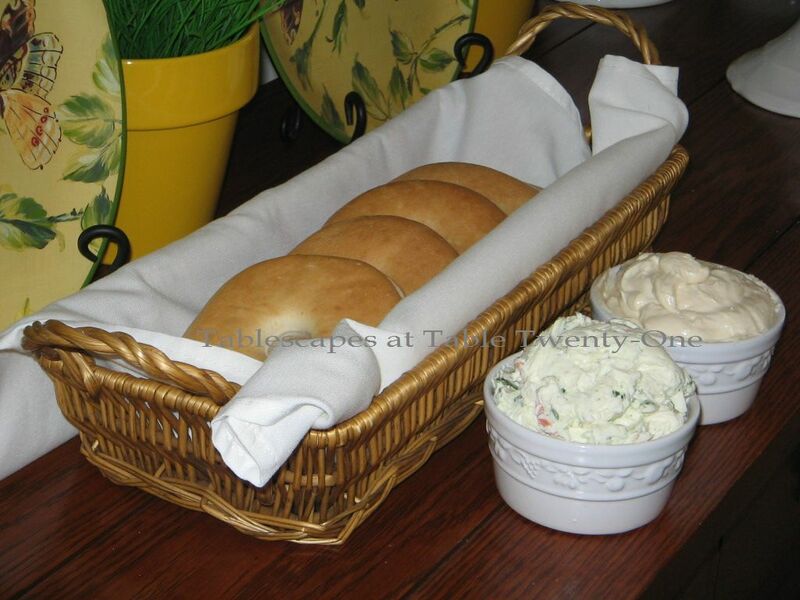 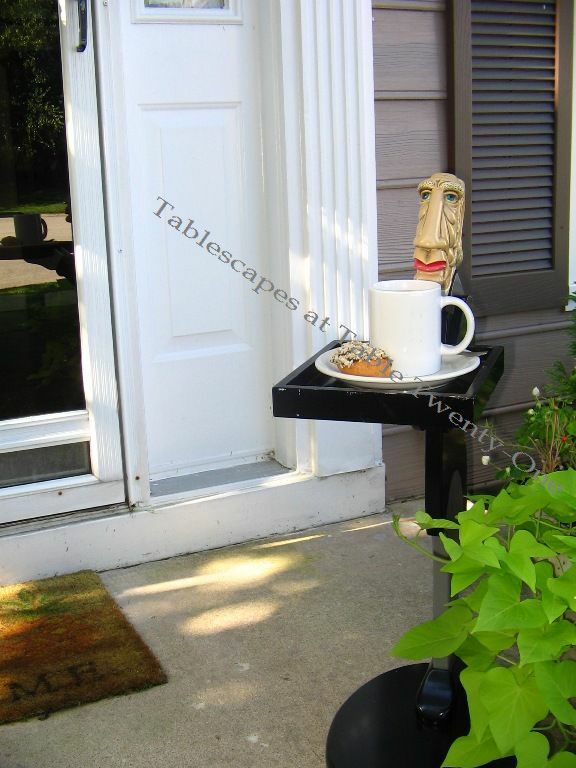 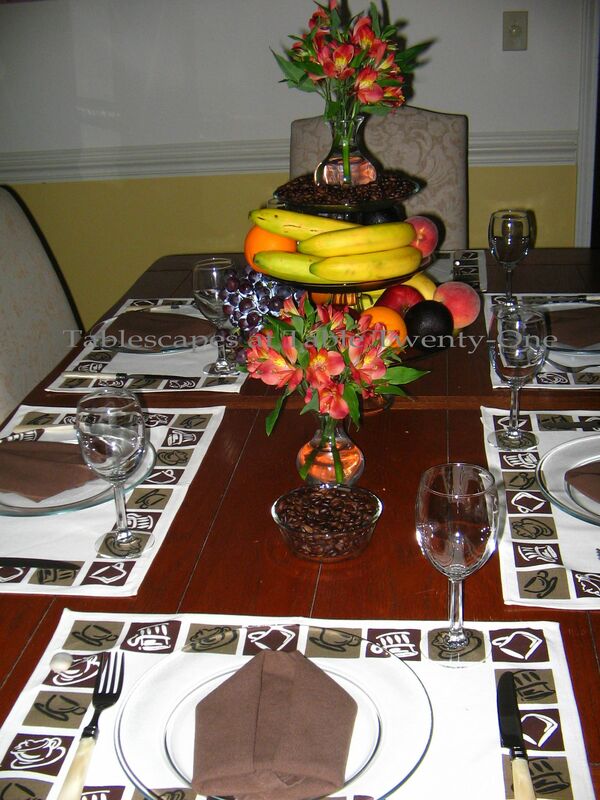 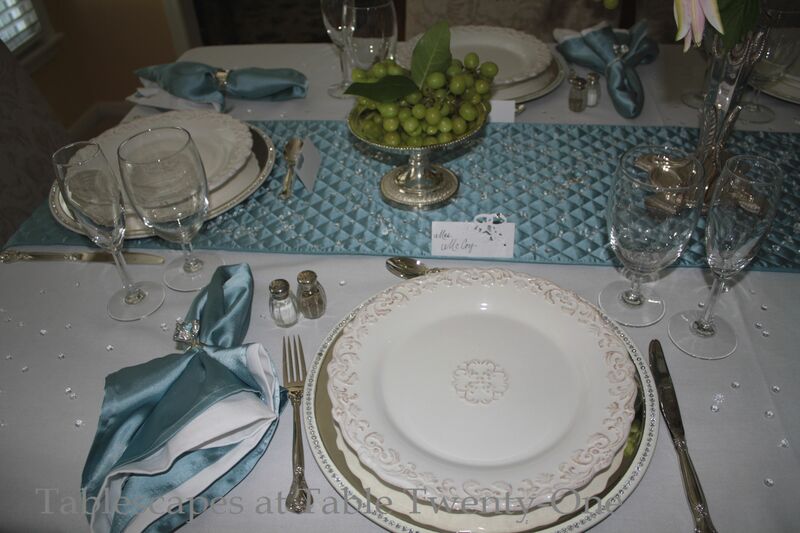 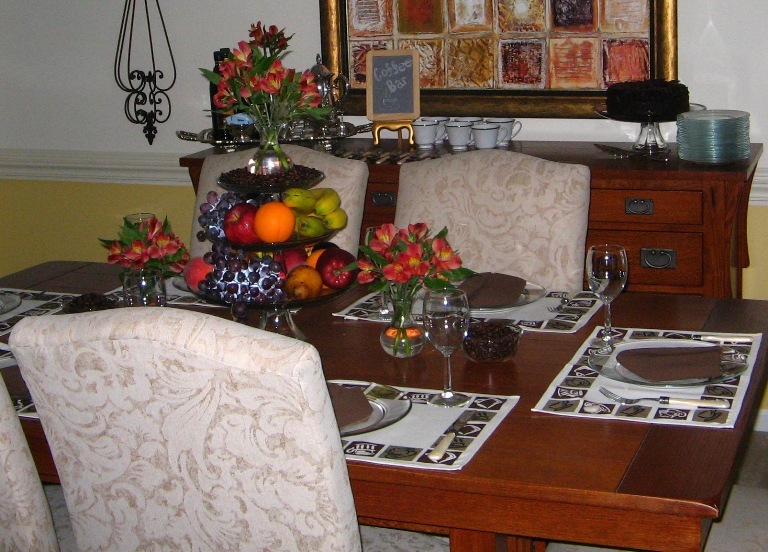 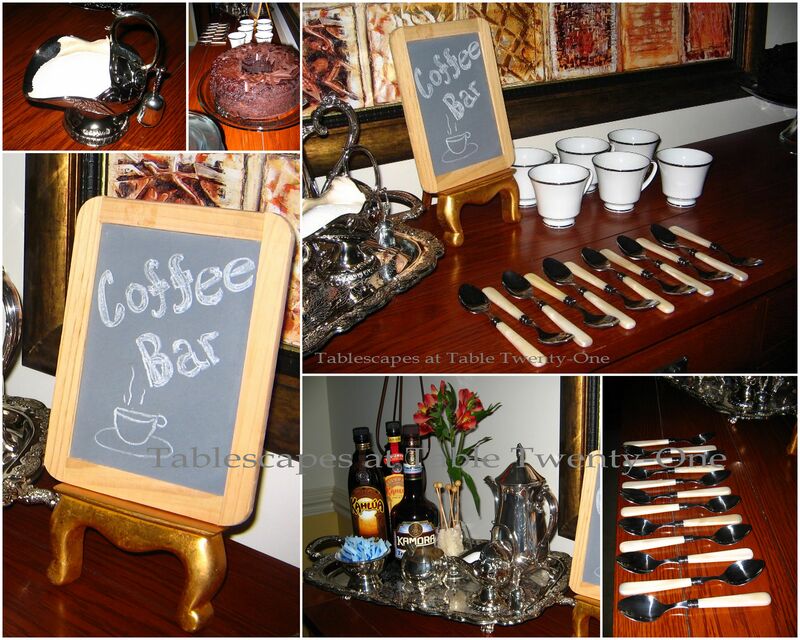 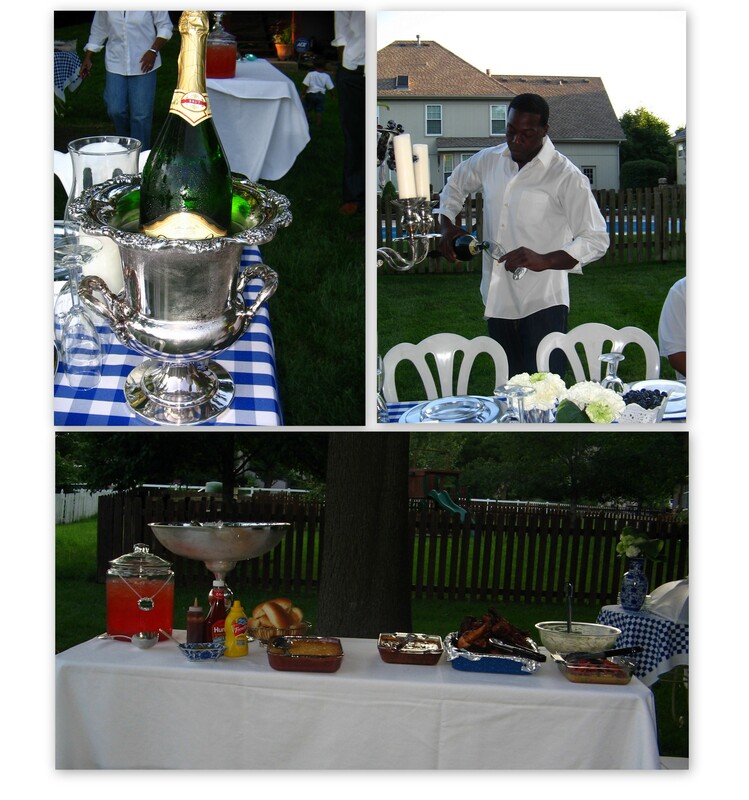 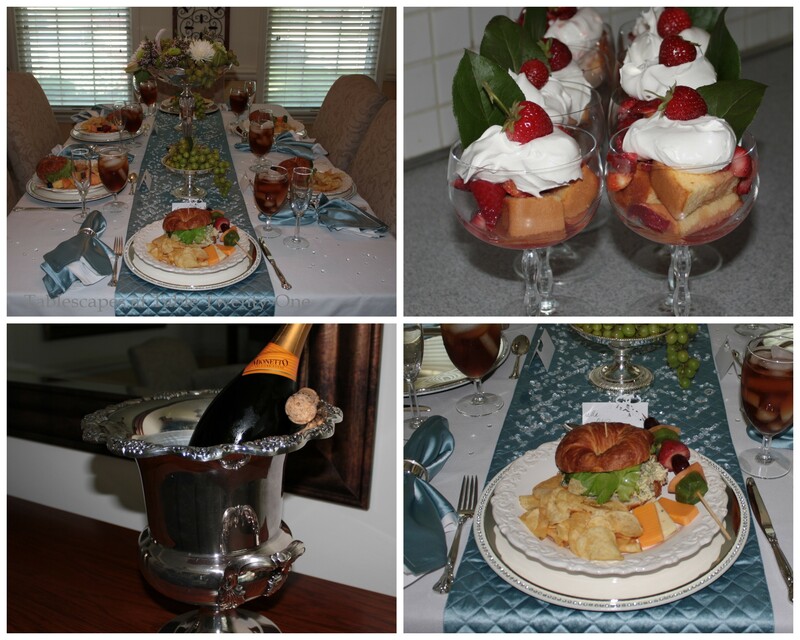 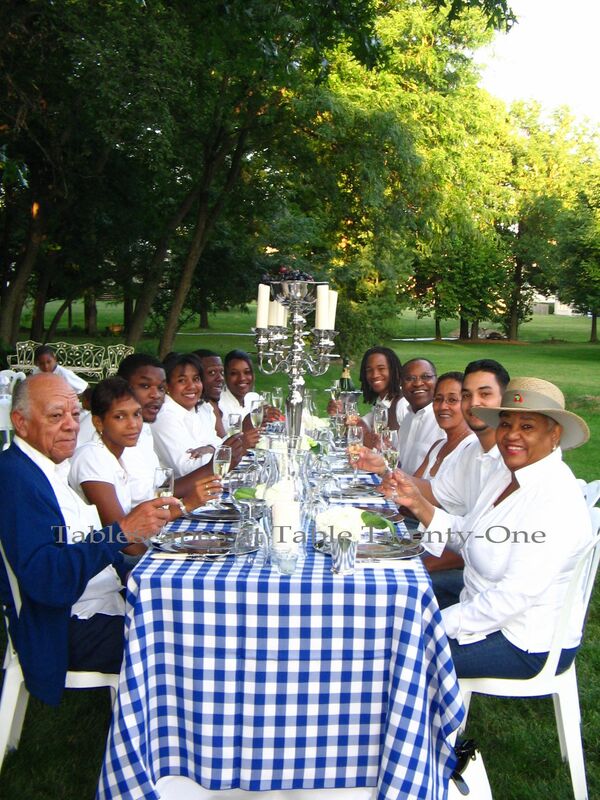 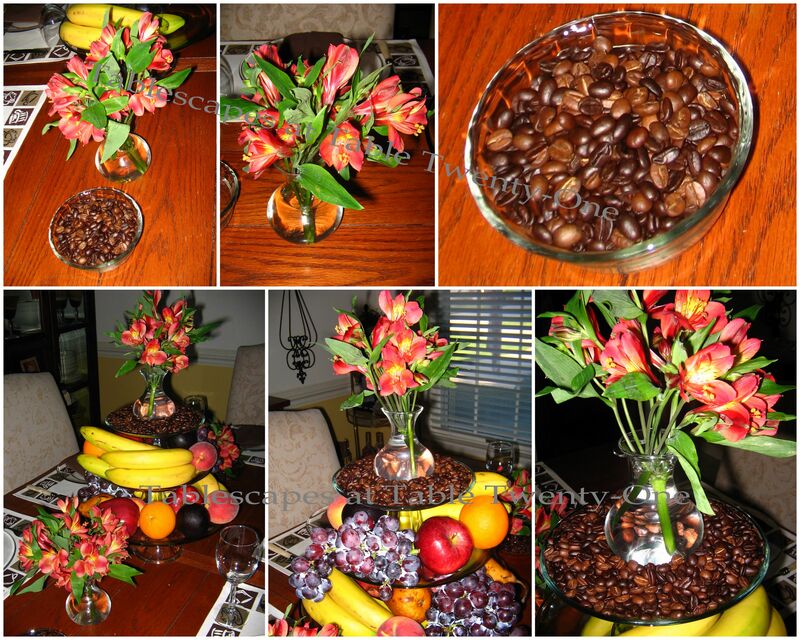 This table begins with a brilliant “Caribbean” blue 108″ round poly tablecloth from LinenTablecloth.com. 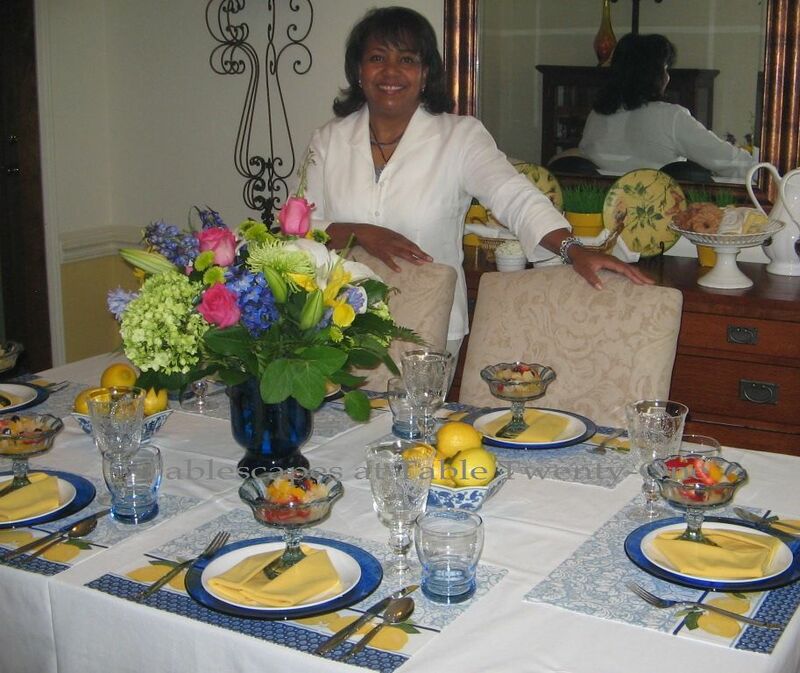 There are so many juicy, bright colors in the plates & bowls (grounded with bits of black & white), and I wanted to pick up on as many of them as possible. 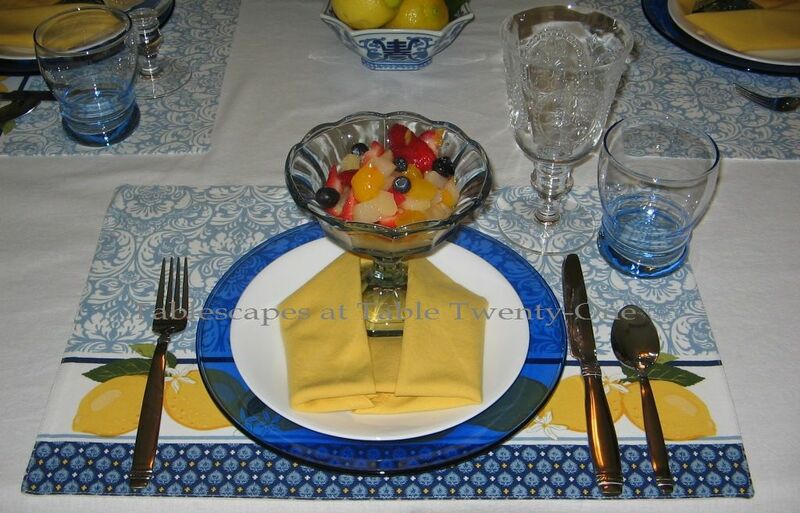 A trio of round woven placemats in orange, aqua blue and yellow from Bed, Bath & Beyond anchor the place setting. 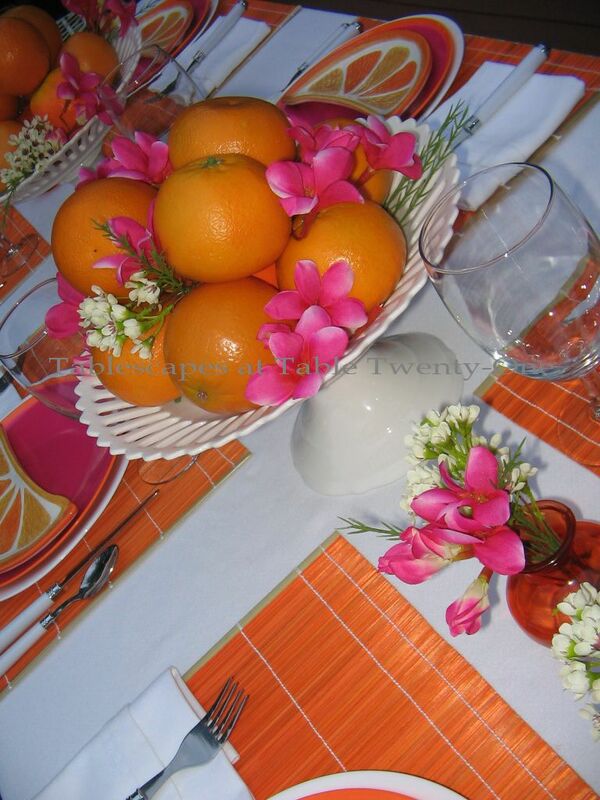 The square melamine dishes have lots of fun stripes topped with images of watermelon, oranges, limes & lemons. 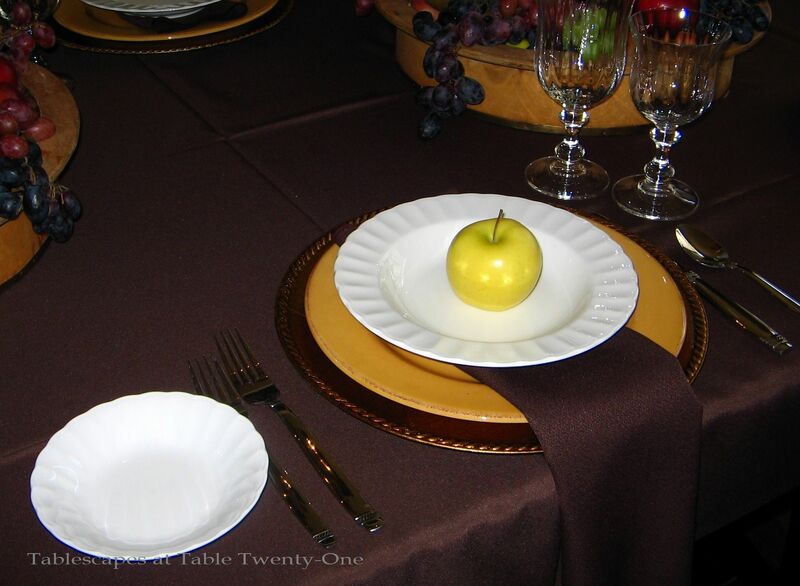 That motif is repeated in the napkins gathered with a wooden watermelon slice napkin ring (both purchased eons ago at BB&B). 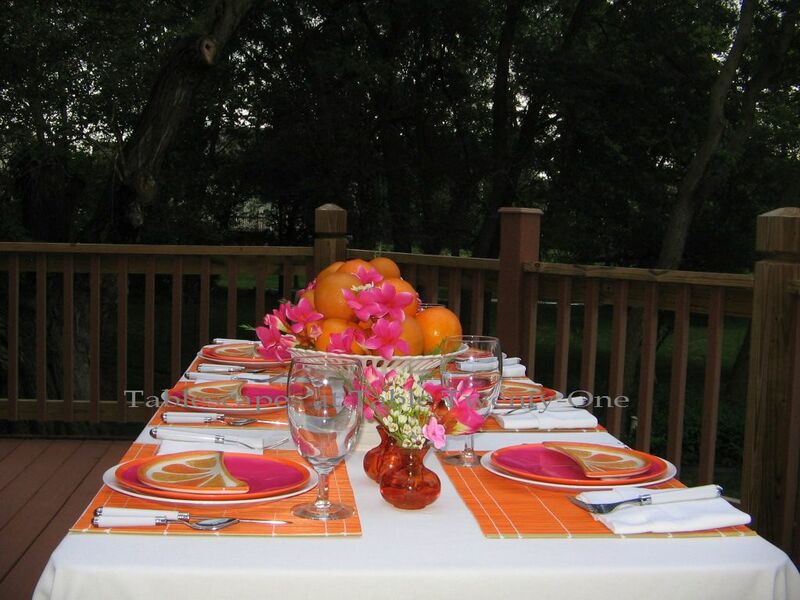 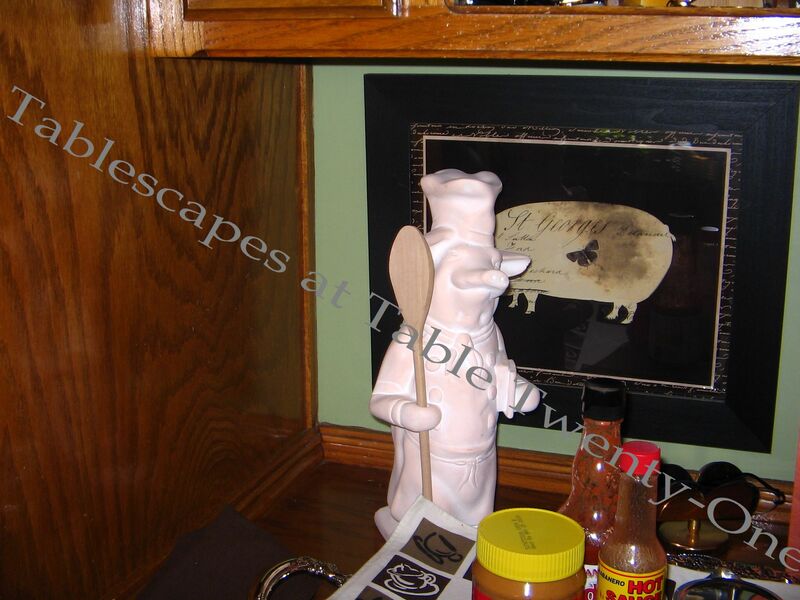 Orange acrylic flatware from Burlington is casually placed inside the salad bowl. 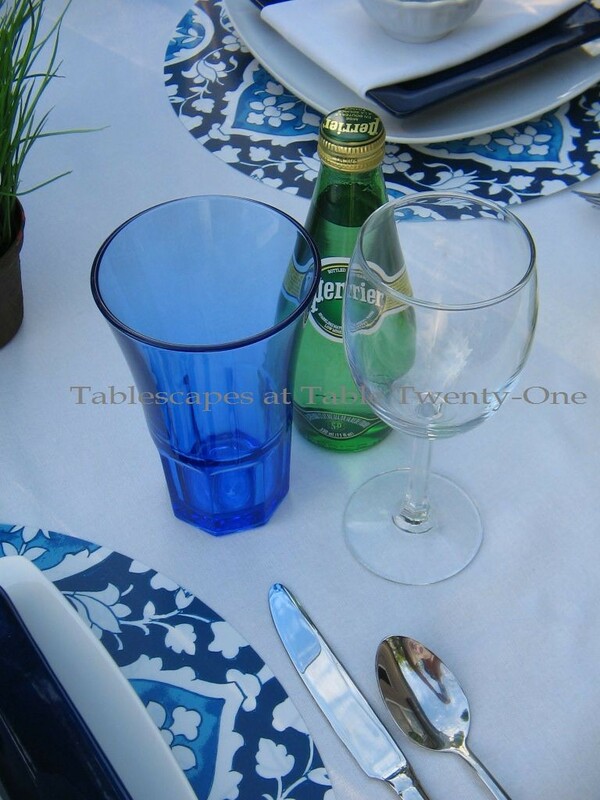 Aqua blue plastic tumblers from Old Time Pottery are easy care and the perfect match for the dishes. 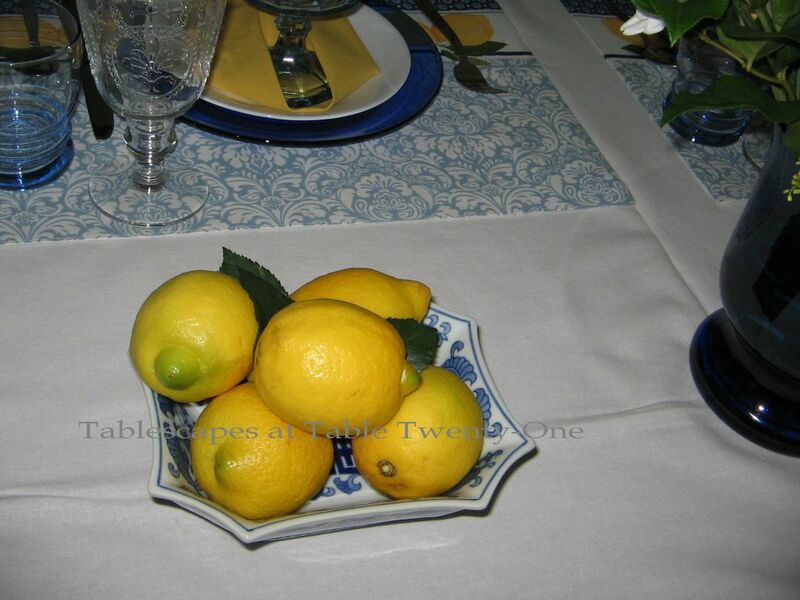 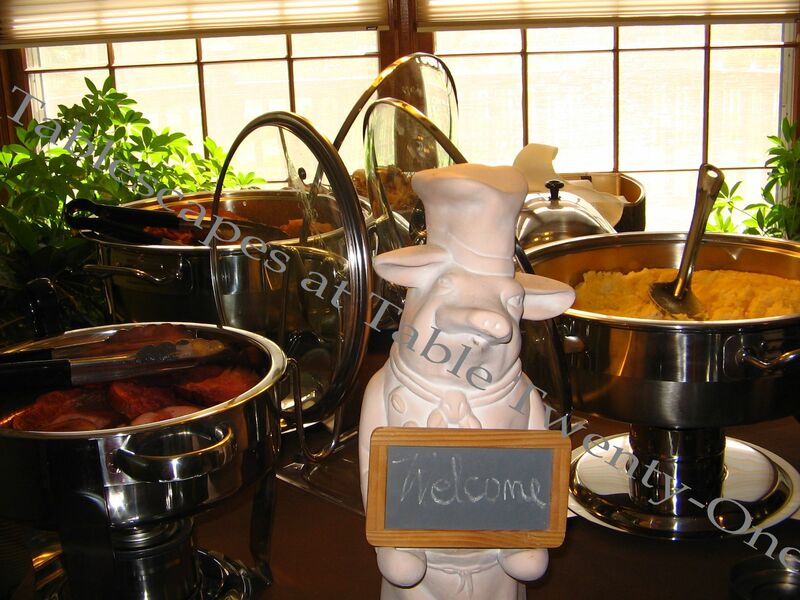 The lemon slice finger bowl blends with the theme. 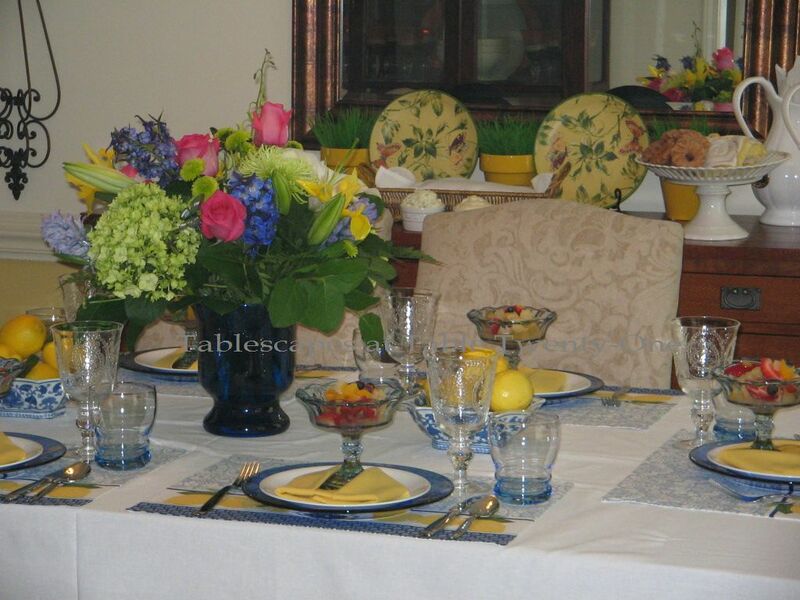 The centerpiece is simple and fun, made up of a bowl of citrus fruits, playful watermelon wedge salt & pepper shakers and an iron tricycle found in the floral department at our local grocer’s. 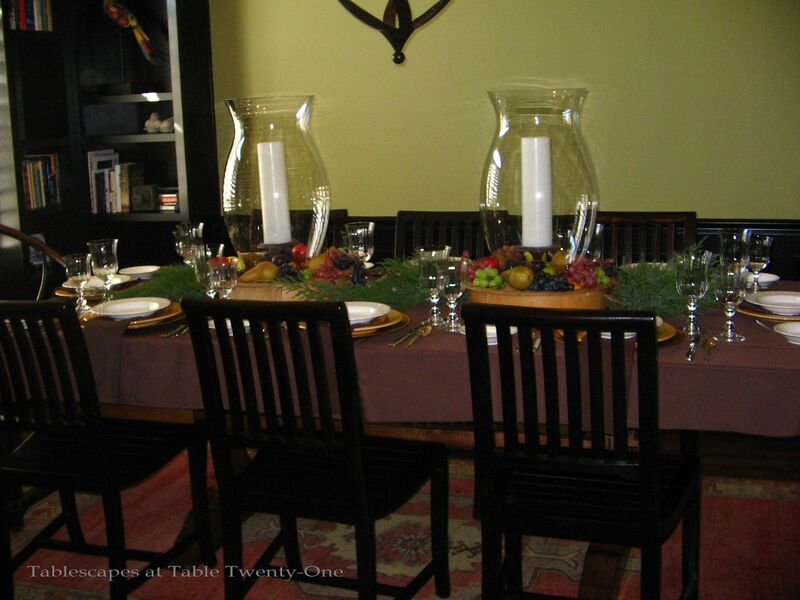 According to Wikipedia, the penny-farthing – also known as a high wheeler and a spinoff of the French “boneshaker” in the 1800s – was the first machine to be dubbed a “bicycle” and was a symbol of the late Victorian era. 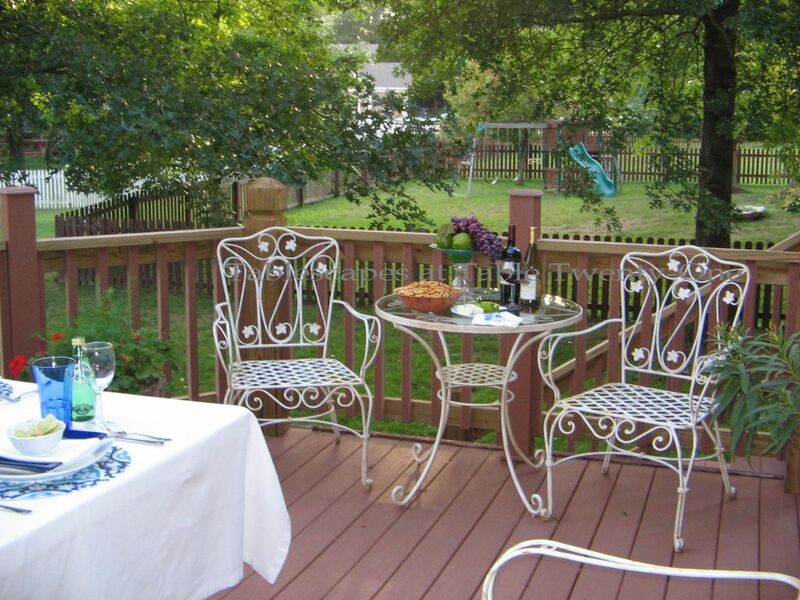 I created a lounge area in one corner of the deck which is nice for enjoying pre-dinner cocktails or dessert. 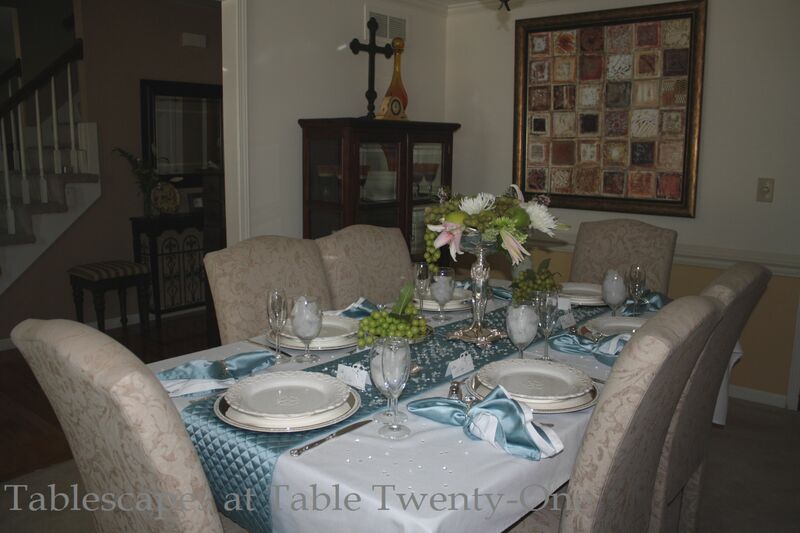 The side table is dressed in a 90″ round LinenTablecloth “Caribbean” blue tablecloth to complement the covering on the dining table. 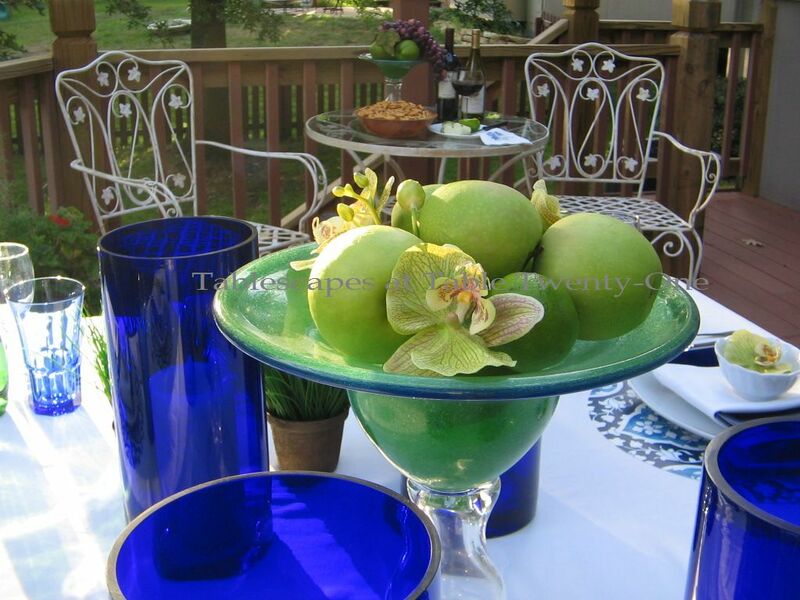 A distressed neon green finial piece from the clearance aisle at Hobby Lobby is joined by another iron penny-farthing and potted geraniums. 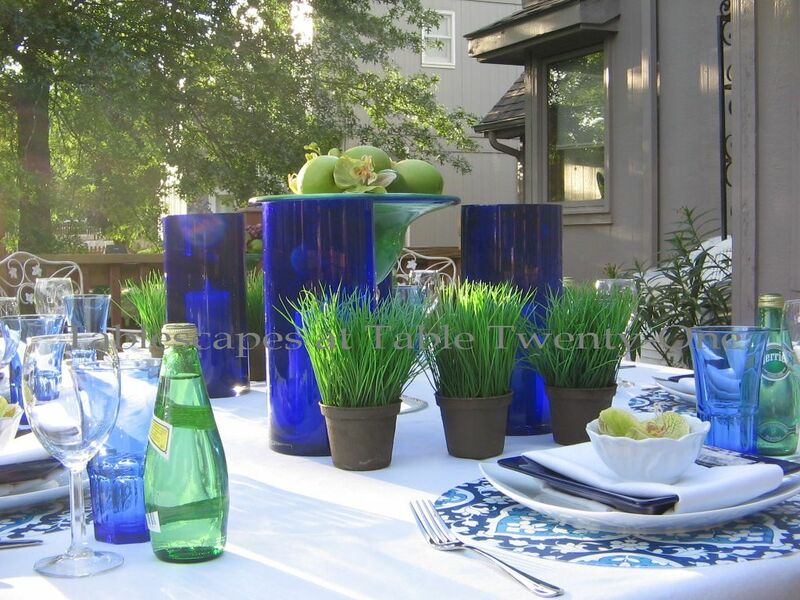 Along with lots of potted plants, a couple of cheery red metal lanterns from Pier 1 add a little extra punch to the surrounding decor and are great for lighting the way after the sun sets. 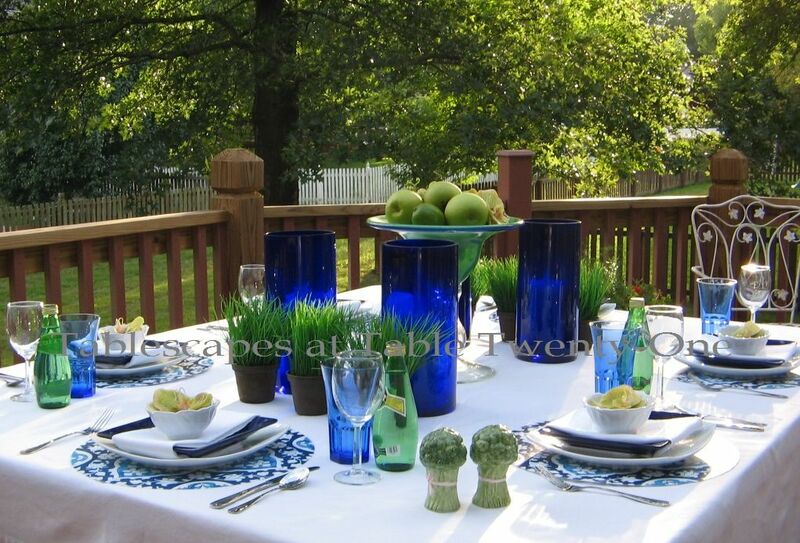 and don’t forget the Summer page with TEN posts on it! 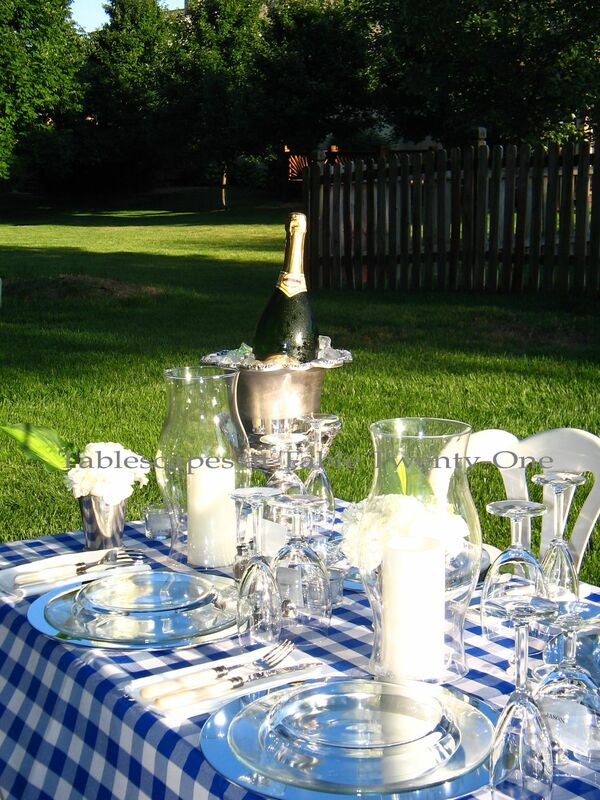 I’ll be partying again this week with Christine at Rustic & Refined for “Table It!” and Susan at Between Naps on the Porch for Tablescape Thursday. 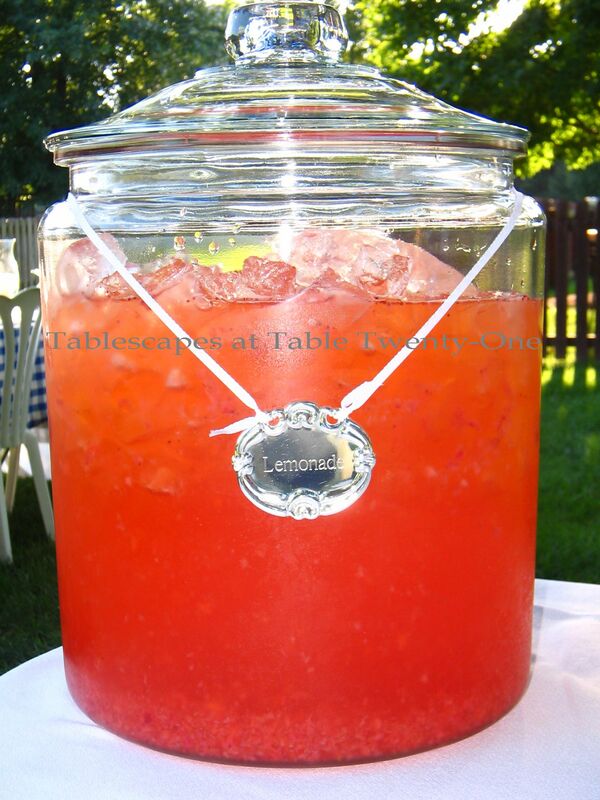 Swing on by both of these fun blog parties for lots of summertime entertaining ideas!